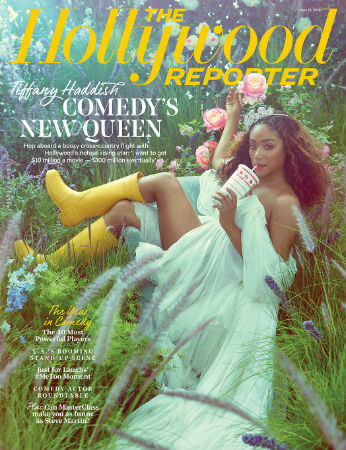 -The biggest soundbite coming out of Tiffany Haddish‘s hilarious THR cover profile is her story about hitting on Leonardo DiCaprio (as it should be — she made fun of his p*ssy posse before telling him “I wanna do it with you as your character in What’s Eating Gilbert Grape….cause I feel like that performance deserves a real reward and that reward is [me]), but the whole damn article is worth your time. She talks about her early unpleasant run-ins with Roseanne, confirms that Sanaa Lathan bit Beyonce, and says she tried to take Taylor Swift to her 20th high school reunion but the singer’s security shut it down. –Jamie Foxx “emphatically denies” sexually assaulting a woman in 2002 at a Vegas party after she allegedly refused to go down on him. –Angelina Jolie‘s rep is blasting reports that she is at risk of losing primary custody of the kids — and seems to blame Brad Pitt’s camp for leaking select court docs. “This misleading leak is not in the best interests of the children…It’s deplorable that someone for their own selfish reasons leaked selective portions of the confidential and sealed court record to create an inaccurate and unfair picture of what is really happening.” Whatever’s happening, legal experts seem to think it’s “extremely rare” for courts to intervene in this way. The judge’s orders that caught my eye was how she must provide Pitt with “each of the minor children’s personal cellphone numbers so that [he] may text them,” and that he can’t be with them unmonitored yet. –Justin Bieber was spotted hanging out with his ex-girlfriend Hailey Baldwin again. The two were “inseparable” in Miami over the weekend when they were both in town for a church conference(!). –Emma Stone and Justin Theroux are still hanging out — but other people were there too so I’m still holding out hope that they’re just friends! -Gotta say, I love that the first marketing material Wonder Woman 2 released was this spoilery photo. Other franchises would spend the entire press tour teasing whether or not a role like this would be reprised, but right outta the gate they are getting it out of the way so we can all focus on other stuff. There’s also some scoop about Kristen Wiig’s character. The film, titled Wonder Woman: 1984, will be released Nov 1, 2019. -I love this article about how Brooklyn Nine-Nine’s Amy Santiago has exploded many a pop-culture myth about smart, driven female characters needing to be cold, humorless, and lonely. -Speaking of great TV articles, this is an excellent deep-dive into how Netflix decides what’s a hit, and how it helps connect subscribers to its all-you-can-eat TV buffet. -And don’t sleep on this article on how Dietland and The Bold Type use fashion to deliver their feminist message. -I didn’t even know that Lady Gaga was engaged. Mazel! –Kim Kardashian is out here changing the world. She’s reportedly heading to Tennessee to meet Alice Johnson after convincing Trump to commute her life sentence, and she also might have convinced the head of Twitter to give us an edit button. -Fans leapt to Selena Gomez‘s defense after Dolce & Gabanna’s Stefano Gabbana called her “so ugly.” What’s wrong with this guy?! –Ryan Reynolds responded to Kanye West in the most Ryan Reynolds-y way ever. -The Stan Lee saga continues to sadden. LAPD are investigating reports of elder abuse, and he’s been granted a restraining order against his business manager. -I really like this take by Lexi Alexander urging showrunners to question every time someone in Hollywood says an actress is “too difficult” to work with. –Sophia Bush admitted she felt pressured to marry her One Tree Hill costar, Chad Michael Murray. “How do you let everybody down…and when you have bosses telling you that you’re the only person who gets a person to work on time, and 200 people either get to see their kids at night or they don’t because our days start on time.” She also talked about why she abruptly left NBC’s Chicago P.D. after four seasons, saying it was because of a costar who is still on the show. -I do love that most of the One Tree Hill cast remains so tight. Hilarie Burton, Robert Buckley, Danneel Ackles, Tyler Hilton and Antwon Tanner are reuniting for a Lifetime movie. -Disney dropped the first trailer for Tim Burton‘s live-action Dumbo, starring Colin Farrell, Eva Green and Michael Keaton.